Sun, sand, and fruity drinks with the cutest little umbrellas. That, my friends, is what I've been wishing for over the last few days (and maybe someone to clean my house for me, but that's getting a little off topic here and that really is no different from any other day of the week). Apparently there's been some sort of mix up going on "up there" because, instead, I've gotten 40 cms of snow, a temperature of -35 with the wind chill, and power outages. Where the hell is my fruity drink? We lost our power early Saturday morning and since we were away for over a week and had no groceries left in our house, I resorted to eating stale chips and some chocolate that I found in my stocking for breakfast. You can imagine how happy I was that I planned to start one of my New Year's resolutions on Monday, and not actually on the first. Phew! After that energizing feast I decided to stay warm by taking down our Christmas tree and decorations because as hard as it is putting that stuff up, it's twice as hard ripping it all down. Not to mention a little sad. 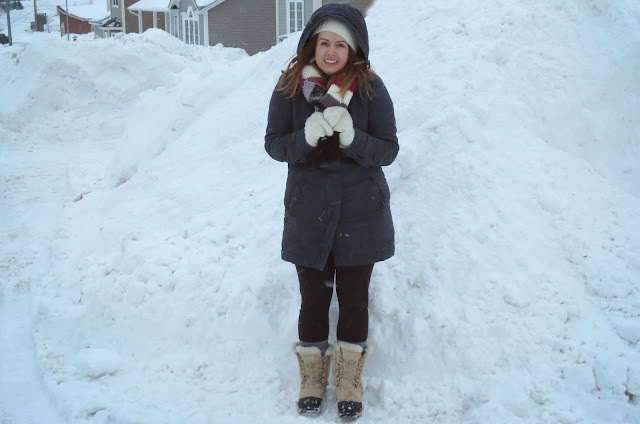 And then we spent hours and hours digging ourselves out of the house. Okay, okay, it wasn't so much of a "we" as it was a Todd. And it actually wasn't so much of "digging" as it was pushing a snow blower. But still. Later that evening we picked up our two friends so we could all grab some "real" food (that was Todd's word not mine, because you all know how I feel about chips). Three hours driving around the city, one empty gas tank, and two jumbo pizzas later, we had four toasty and happy people. And then it was time to go back home and face the icicles that had grown onto our floor. I won't bore you with the rest of all of the details of the night, but it went a little something like this-- an unfinished game of monopoly in our blanket fort, a bedroom that smelled better than the Bath & Body Works store due to the fifteen candles that were lit before we went to sleep, bedsheets that were piled high to the ceiling, skiing wardrobes that included everything but the ski pants, and enough juice left in my computer to fall asleep watching the oldest DVD we owned; The Goonies. But we survived, and luckily our power came back on this afternoon. Unfortunately for the next few days we'll be experiencing what they call "rotating power outages" in order to balance the provinces generating system because of such an increased demand for heat. Basically, we'll all be taking turns without power so that other people can have power. That sounds so strange but I guess it's better than all of us doing without. My only wish right now is that I hope my turn doesn't happen soon during the premiere of The Bachelor. I think I'd rather wear those ski pants to bed after all instead of missing out on that. But since my wishes haven't exactly been working in my favour lately, I'll just say that I really, really hope it does! !